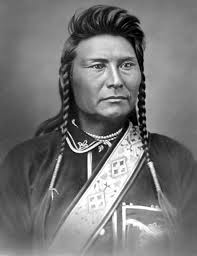 Thunder Rolling Down the Mountain, also known as Chief Joseph, was a leader of the Nez Perce Nation. He lived during the time where his people were forcibly removed from their ancestral lands. After a series of broken treaties, and broken promises, a band of about 750 people left the area, and were eventually headed for Canada to join Sitting Bull, or at least to live in peace, as free men and women. They were pursued by the U.S. Army, which became known as the Nez Perce War. It wasn’t much of a war. Cannon fire was used against men, women, children, and old people (several times). They were pursued 1, 170 miles over a three month period. More than 150 of the people were killed. Thunder Rolling Down the Mountain, was reluctant to fight the war in the first place. He surrendered in order to save what was left of his people. They were less than 40 miles from the Canadian border. The best book I have seen on this topic is by Kent Nerburn. He is an excellent writer, but he also tells the story from the First Nations point of view. He shows the humanity and compassion of the Nez Perce. If you are interested in history, I highly recommend it. The first two chapters are some of the best writing, of any kind, that I have seen. You might as well expect rivers to run backwards, as any man born free to be contented penned up. Blessings to everyone (both brothers and sisters! ), and PEACE! So horrific. Shameful and insane. I can’t read about it because I won’t sleep thinking about the injustice of it all and I can’t do anything about what happened. It’s still going on…everywhere. The insanity/greed/hatred/prejudice/violence and destruction…never stops. I’m sorry. Gigi, you are a very caring and compassionate person. I am so glad you are part of my blog! 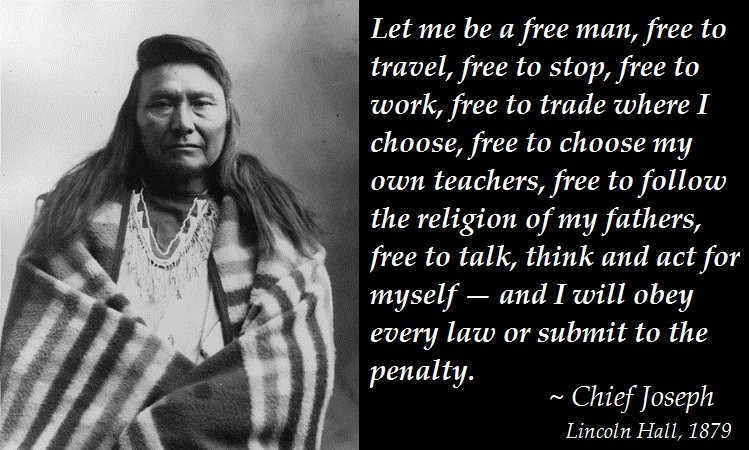 Chief Joseph does have some wonderful quotes, which are easy to find. Maybe you could quote him on your blog someday! Just a thought. Blessings to you. I will certainly do that. I have read about Native Americans for a long time. Poetry and the beauty of their ways, but I can’t stand to read about the terrible things that were done to them (and are still being done to them). Thank you for understanding. It’s just so sad. I could never read the Trail of Tears. I just read books that told of the beauty of their lives. I understand completely. I try to write stories like that, with healing and restoration. I love their culture and their closeness with nature. Thank you Deanne for your wonderful comments! Yes, that is where it all begins. Thank you for your comments! I would, also, recommend the classic, “Bury My Heart as Wounded Knee”. It will make you weep. Thank you Anna for your comments! I have read the book, by Dee Brown. You’re right it’s a heart breaker.